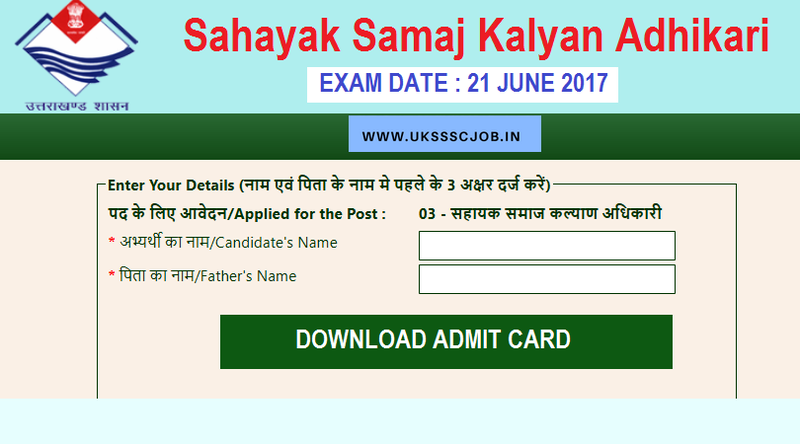 UKSSSC Uttarakhand Subordinate Service Selection Commission has released the UKSSSC POST CODE 03 Sahayak Samaj Kalyan Adhikari Admit card 2017. 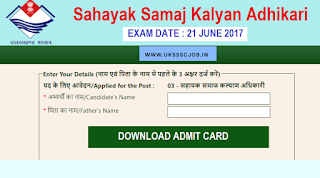 Candidates who have applied for the UKSSSC Uttarakhand Group C Sahayak Samaj Kalyan Adhikari post code 03 now they can download Sahyak samaj kalyan Adhikari post code 03 Admit card 2017 from the official website of UKSSSC or Via Direct Link given below By WWW.UKSSSCJOB.IN . UKSSSC has scheduled to conduct the written exam date of UKSSSC Sahayak Samaj Kalyan Adhikari Post Code 03 on 18 June 2017.